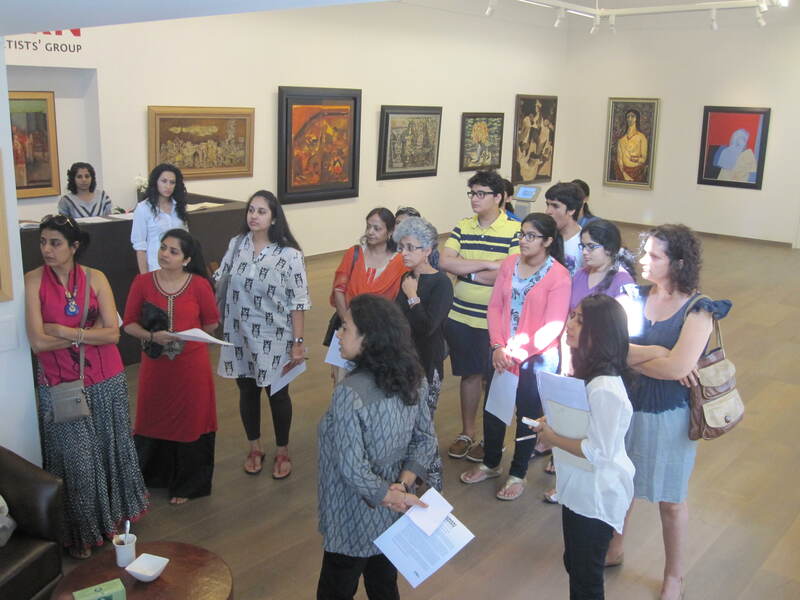 On December 7, Art1st MPC and Delhi Art Gallery hosted a collaborative Open Minds session – a walkthrough of the exhibition ‘Retrospective of the Progressive Artists Group’. 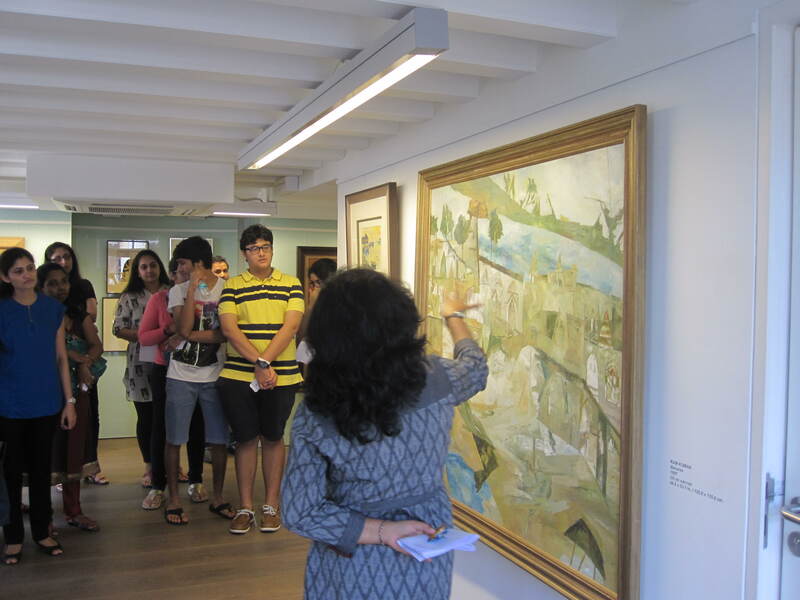 As participants trickled in, making way through the by-lanes of Kala Ghoda on a Saturday morning, the ground floor of the gallery started filling up with curious students, teachers and parents of students, and soon bunches of participants got scattered in observing paintings. It was wonderful for participants to stroll at ease, through the sunlit three-storey gallery, with wooden floor, white windows with pretty grills, and be absorbed in original paintings by the Progressive Artists Group, one should consider fortunate to be able to experience up-close. Soon, our moderators Amrita Gupta Singh, Program Director, MPC and Tehezeeb Moitra, Research Associate, DAG began the session, speaking about each painting, moving from one master painter to the other. The moderators spoke of the painting style of the artist, content of the painting, background and nuances of the painters’ life that influenced their paintings, emotional influences on an artists’ work, historical background and analytical remarks on each painting. The moderators took the participants through works of M. F. Husain, H. A. Gade, S. H. Raza, K. H. Ara, S. K. Bakre, F. N. Souza, Bal Chhabda, V. S. Gaitonde, Krishen Khanna, Tyeb Mehta, Mohan Samant, Akbar Padamsee and Ram Kumar. For many of the teachers, it was the first time visiting an art gallery. They mentioned that, to begin with, the session simply helped them to understand how to look at a painting, what aspects to consider while analysing and got aware of perceiving an art work. “I always used to wonder, why I liked certain paintings but never knew how to articulate the reasons for liking them. This session has brought clarity in that aspect”, said one of the participating teachers. Even unconsciously, any visitor would walk out informed about the Progressive Artists after strolling through the Delhi Art Gallery, Kala Ghoda, which is surrounded by places like Artists’ Centre, Samovar Cafe, Jehangir Gallery, which were ‘adda’ of many of the Progressive Artists in the days. The walkthrough was followed by a presentation on the fourth floor of the gallery, which has a small sculpture room. Beginning with a few examples from paintings from the early 1900’s, the moderators set base to explain what was happening in the art scene in India before the Progressive Artists’ Group came about. Visual examples realistic paintings by Pestonji Bomanji, Abanindranath Tagore and Raja Ravi Varma led the presentation of the modernists. Questions of nationalistic purpose of the Progressive Artists Group, Eastness, Japanese traditions, articulation and the artists’ thrust on the need for Indian art to have its own modernity were discussed. The presentation took the participants through more visuals of each of the artists that they had discussed during the walkthrough, sometimes drawing comparison with European masters, with similar style and subject matter. Quotes from each of the artists added in understanding the artists understanding and intention further.